Home shopping can be a long, drawn-out experience, but it can also be fairly enjoyable depending on what your tastes are and where your priorities lie. However, shopping for the right home can also be a dangerous game. Why? That’s because it’s really easy to start fantasizing about living in a particular house without actually knowing if it’s the right home for you and your family. After a long and painstaking process searching for the ideal home, it almost seems like the right thing to do is just to give up and settle for a home that looks good without exercising the proper due diligence to ensure that your new place of living won’t be giving you any home insurance headaches down the road. As home insurance experts ourselves here at Bradley’s Insurance, we can’t stress this point enough: make sure that you’ve evaluated any potential home insurance risks for the home that you’re interested in purchasing. Buying a home truly is quite the lengthy process. While we’re no realtors, we are experts in home insurance. 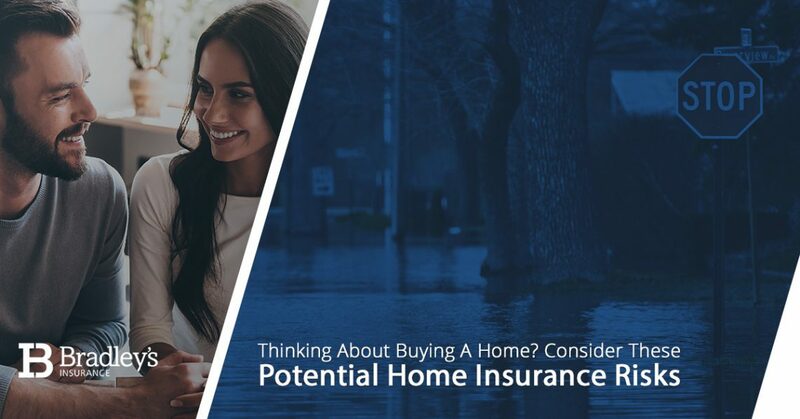 Below, Bradley’s Insurance is going to cover some of the important ins and outs of identifying various home insurance risks…before you buy that house that your heart is set on. If you’d like to learn more about how we do Ottawa home insurance our way here at Bradley’s, feel free to visit here. As always, feel free to reach out to our Ottawa insurance brokers with any questions that you have regarding homeowners insurance, auto insurance, and more! We’re as transparent as the insurance policies that we help our valued clients connect with. Before you buy a house (that’s not brand new), you should always make sure to get the property inspected by professionals. This is because you’ll want to get a proper assessment of the condition of the home’s structure and associated systems, including but not necessarily limited to things like the foundation, the roof, heating and air conditioning, and so forth. An inspection is also a great way to identify and address if any repairs are needed, and if so, what needs to be done first. However, even the most thorough home inspections will not reveal whether or not the home in question is in an area that is prone to extreme weather conditions or has an extensive history of insurance claims. As you can imagine, both of these items present home insurance complications down the road. How do you know whether or not a particular property is safe to invest in, especially when a home inspection isn’t going to do you any good? Here’s what you can do. If you have access to a PSC (Public Safety Canada) or FEMA flood insurance map for our American neighbors (you shouldn’t have any trouble obtaining one), then use it. Flood damage should be one of the biggest worries for homeowners both brand new and longtime. Even more worrisome is the fact that most standard homeowners insurance policies do not cover flood damage. However, to alleviate some of your concern regarding future flooding, you can check to see if your prospective property lies within a flood zone. Various floodplain mapping network websites will allow you to search flood maps by address or coordinates. Bear in mind that it may be worth sitting down and looking through this map with an expert, because understanding the nuances of a floodplain risk area can be a little daunting at first glance. It’s never a bad idea to reach out to your local town or city government regarding the purchase of an older home and the inherent or potential home insurance risks that accompany it. Oftentimes, regulations are specific to a certain town or city, and these officials can help make clear of any relevant regulations that you should know about. This includes anything that you need to know about regarding bringing your property up to code if you decide to do any major renovations. Ideally, you’ll want to avoid a down-the-road-headache of beginning a seemingly minor home improvement project, only for it to turn into a massive headache — and an expensive one at that — due to a sleuth of housing-code issues. To be more specific, by “look into,” we really mean “investigate.” Did you know that credit reports track a home’s history as far as insurance claims go? Where a thorough home inspection fails, an extensive credit report will bring any outstanding (or just any) insurance claims to light throughout a home’s history. The C.L.U.E. report, also known as a Comprehensive Loss Underwriting Exchange, will provide a seven-year history of any known losses on the property. This includes detailed information such as the date of the loss, the loss type, and amount paid. A-PLUS reports, or Automated Property Loss Underwriting System, can also help dig up any buried insurance claims. Usually, both of these reporting systems are used by insurance companies to assess a home’s risk relative to selling a home insurance policy. Everyone deserves to buy a home with confidence. That’s why Bradley’s Insurance represents ourselves as the go-to Ottawa home insurance experts, helping people like you find the right policy. Your peace of mind is our goal. Get started today by contacting us with any questions or getting an instant quote!